A creamy, flavorful soup that is quick to make, hearty, and full of chicken, beans, corn, and tomatoes! Add toppings of choice and you have a meal that everyone will enjoy! When my hubby and I first married, over 11 years ago now, one of the things he swore he didn’t like was soups. I know, crazy right?! That could have been a deal breaker, lol, but I took it upon myself to make it a challenge to convert him. Help him see the light. I mean, how can you honestly NOT like soup? What does one do in the winter, dark, cold months, when they are trying to warm up. Eat a bowl of soup of course! Comfort food at its finest, hehe! Fast forward through SEVERAL recipes of soup and I think its safe to say that he no longer says he doesn’t like soup. Yes, he can be difficult and say “its not his favorite thing”, but I must say, for someone who “doesn’t like it”, he sure enjoys scraping that bowl clean, lol! 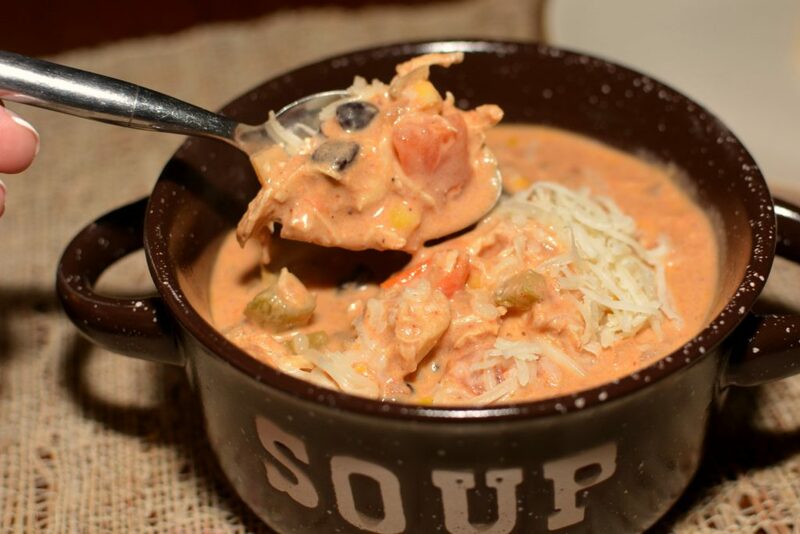 I made this chicken enchilada soup the other night and the entire family loved it. The enchilada sauce in this gives it a little kick, so my three kids of course had their glass of water nearby, but don’t worry, this soup wouldn’t be classified as “spicy”. Just a slight kick to it! You can add in some fresh avocado, green onions, etc. on top and really make it your own if feeling adventurous! 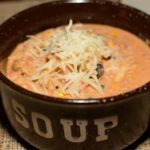 This is one of those soups that is perfect for a busy evening, cold winter night, and the best part is, it freezes perfectly! I had this ready to serve, start to finish, in under 30 minutes, so I would say that makes this a very family friendly meal! Serve with some tortillas and maybe a side salad and dinner is served! A hearty, flavorful soup that is packed with chicken, beans, corn, and diced tomatoes! This is a great, family friendly meal that is ready in under 30 minutes! Once oil is heated, add in the onion and green pepper, cooking for about 3-5 minutes. Pour in the enchilada sauce and cream cheese, stirring until cheese is completely melted. Add in the tomatoes, beans, and corn, allowing to cook for about 5 minutes. Add in the cooked chicken and broth, cooking on low for about 10 minutes. Remove from heat and serve in bowls. 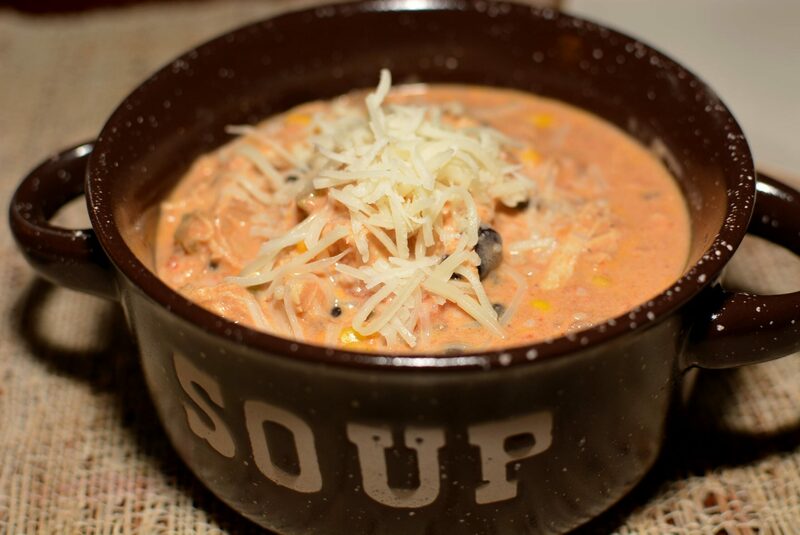 Top each bowl with shredded cheese and toppings of choice before serving! Enjoy! Made this last night. Tasted amazing and very simple to make (only addition was a little can of green chilies). My husband was obsessed and couldn’t stop eating it.